With the topic of fears and hopes that are brought about by technology, science, and their advancements, BarCamp Prishtina #43 invited speakers from two interesting fields of work who shared their views and thoughts on how technology and science impact society and what kind of fears and hope these developments instill in us. The starting speaker was a member of the IPKO Foundation staff, and shared about the DOKU.TECH Conference. This edition took place on the 1st of June, 2017, in the Oda Theatre, as per usual starting at 17:30. Speakers for this edition were Blerim Rexha, well experienced in IT Security and a well known professor at the Prishtina University of Electrical and Computer Engineering, as well as Besa Shahini, who studied in Canada, and came back to Kosovo to impact the public education policies and is founder of Education Plenum – which aims to gather all relevant and willing education stakeholders with the aim of discussing and analyzing how to best improve education in Kosovo and how to involve everyone in this effort. 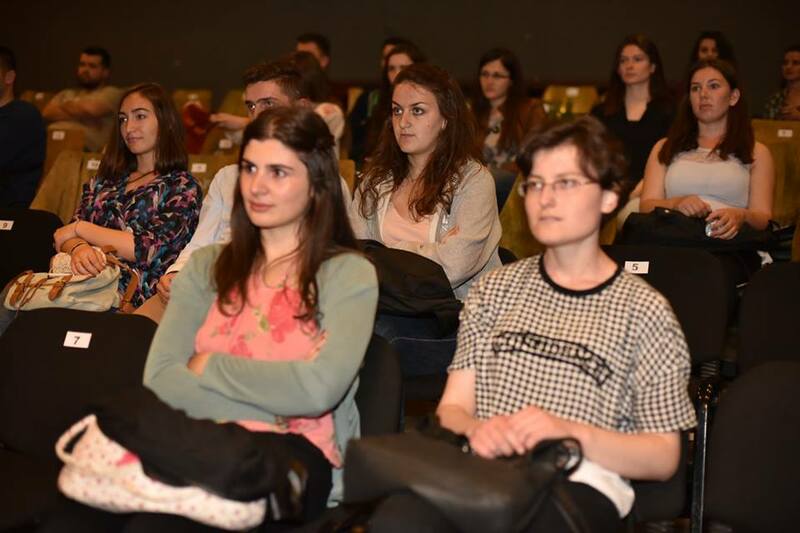 The first speaker of the 43rd edition – Member of the IPKO Foundation staff – presented about DOKU.TECH, a conference that talks about the social implications of the latest technological advancements. This year, DOKU.TECH tackles the topic of “Fear, hope, and everything in between”, and will discuss the the hopes and fears that come with the newest technological developments, the kind of hopes and fears it instills in society regarding how much of a threat or help it will be to humanity, and what we hope it to be in the future. Besa Shahini shared her experience of studying abroad in Canada, and that at first, she was a non-believer as far as technology is concerned. “I refused to buy a washing machine the first three years it came out” she declared, as it was hard to keep track of electricity and water that it spends. But later on, Besa started realizing that technology helps tremendously in the personal and professional life. She came back from Canada, having also studied political science, and is of the opinion that it is wonderful to live in a country that’s being built up and developed. Besa believes that technology is a great help to society, and it has helped in many areas of life, such as desktop research and online communication. One thing that technology can’t help with, though, is the physical side of things – such as going on on the field and asking questions, performing in meetings and etc. One problem Besa sees with the internet is the need for security, and the amount of danger we find ourselves in if we have our computers hacked and information stolen. This section, according to Besa, is an area that needs special care and attention by computer users. Blerim Rexha had a different view on the internet from our first speaker, as he believed that the internet has changed everything and it occupies many areas of our time – even the times we are not busy or doing anything. Blerim is an accomplished IT security expert, and a teacher at the University of Prishtina, and throughout his talk he expressed much of his respect and love for the IT and Electronic Engineering. In the future, according to Blerim, the internet will be everywhere and it will be one of the basic requirements! “Day by day, by putting information online, we are building a world where google will know more about us than about itself”, claimed Blerim. We are using the internet for social reasons and for connecting, but one day, according to Blerim, the internet will know more about us than we know about ourselves. The final talk of BarCamp was concluded with encouragements to the youth by Blerim, saying that they are the future of this country and whatever they contribute in the technological field will be greatly beneficial to Kosovo and is utterly needed.